The monarchs are making their way south, and the hummingbirds are all but gone. 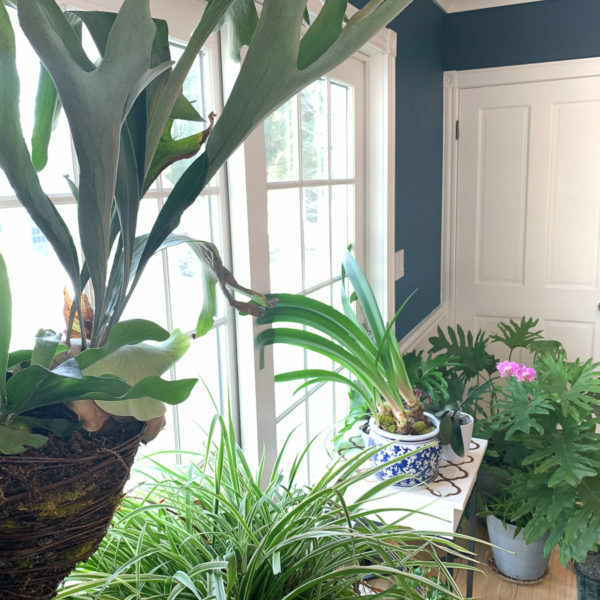 The geese overhead seem to be pointing south and all this migration can only mean one thing: It’s time for the annual houseplant migration. I like to think of myself as a good gardener, but I am a lousy caretaker of houseplants. If it weren’t for the renewed vigor my houseplants get from spending the summer outside, I’m certain they would all be dead. I don’t water them enough (overwatering has never been my issue), I forget to start fertilizing again in late winter and I’m usually late on catching onto any issues they might have. 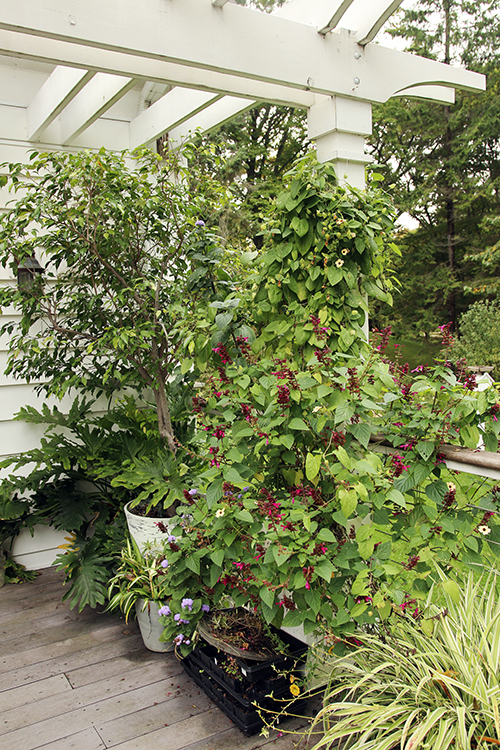 The house plants spend their summer in a corner on the deck, giving it a bit of a jungle feel. 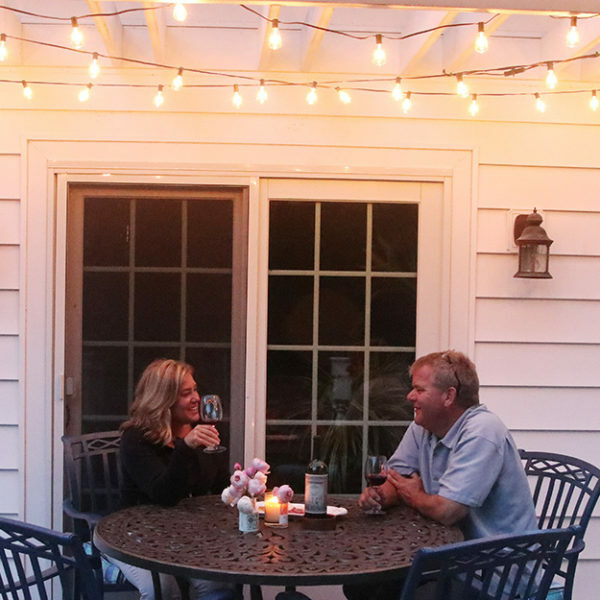 But I like having them around, so make sure to get them inside before frost gets them in fall. Ironically they get better care during the migration than they do at any other time of the year. The migration starts a couple weeks before the plants get moved inside. This is when I start giving the foliage a strong spray with the hose. About a week before they come in, I water them really, really thoroughly, almost to the point of flooding them. The idea is that I flood out any bugs that might be in the soil. I’ve never had a problem with bugs inside using this method but if you are really worried about it, look into Amy’s debugging strategy for houseplants. I like to tidy up plants outside where I can make a mess where it’s easy to clean them up. 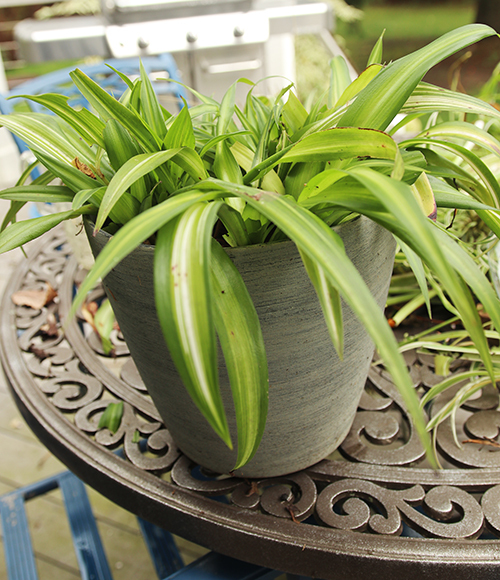 For the spider plants, of which I have two, I start by cutting off all the babies. This probably makes me some sort of plant monster, but it’s my truth. After that I pull out all the dead bits and on the one plant that seemed to have been chewed by something, I cut out any unsightly leaves. 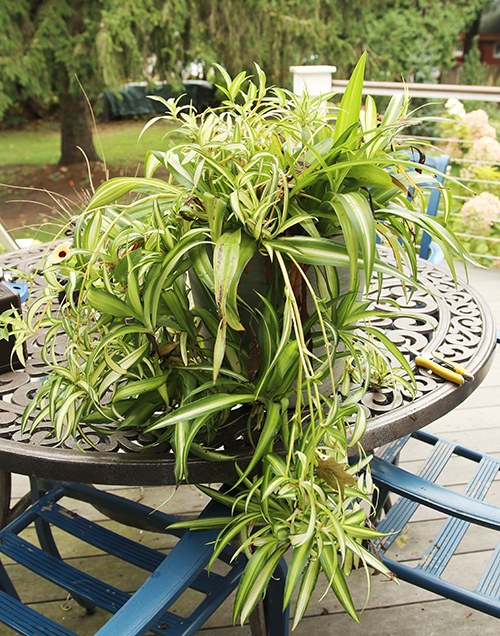 By the end of summer, one of the spider plants was rocking a shaggy ‘do. Here’s what it looked like after I cut off all the babies and pulled out all the unsightly bits. Fun fact (that I’ve shared here before): I bought one of my spider plants the day I moved to college. I’m not going to tell you when that was, but let’s just say it was a different millennium. The philodendron gets a pretty rough treatment. I cut off a good amount of leaves just to manage the size and clean off any dirty bits. 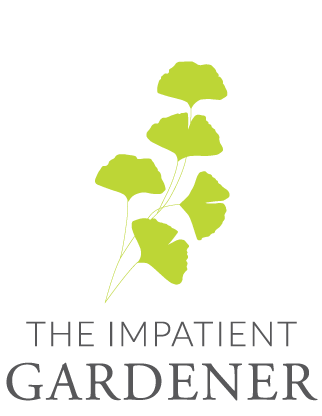 Other plants get the same treatment: prune for size, pull out unsightly leaves, generally try to make them less disreputable. 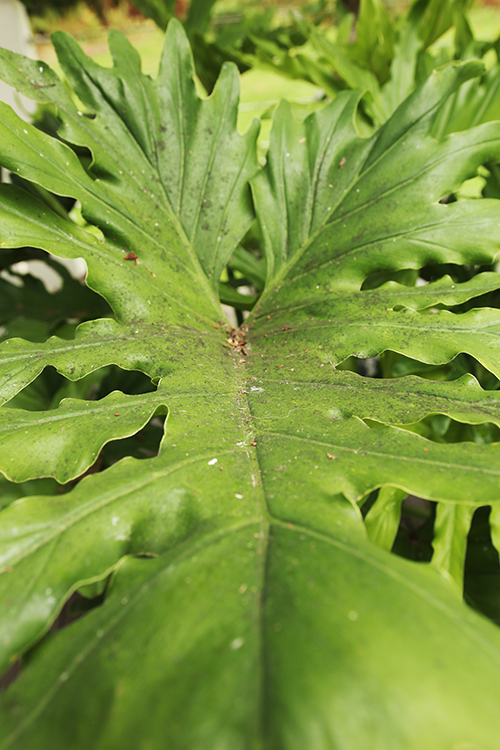 Philodendrons collect a lot of dirt in their leaves during the summer. All of this mess gets cleaned off before they come inside. But the ficus is a different story. This is an important plant. It was grandmother’s who kept it in her sunny living room for years. Festooned with a few lights and some red ball ornaments, it served as her Christmas tree for a few years. When she died, I became its caretaker. Last year it got a bad case of scale, which I treated with some success, but it bounced back well when it got outside. But when it came time to clean it up to bring it in I noticed some unsettlingly issues. 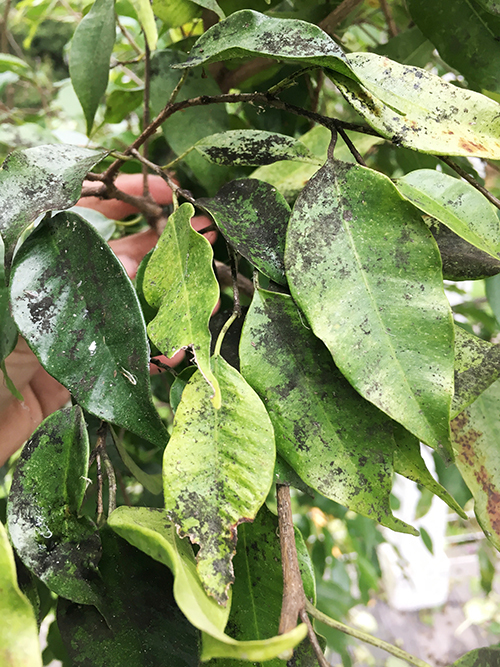 Some (um, many) of the leaves were covered in black … mildew? Dirt? I don’t honestly know what it was but in most cases the leaves didn’t seem to show issues beyond that. Many of the ficus leaves were not looking good. Whatever it was, I cleaned it off, leaf by leaf, and it took a very long time. I think it may have been dirt that stuck to leftover honeydew from the scale infestation. In any case, I took an extra step of treating the entire enormous plant (um, tree) with insecticidal soap. 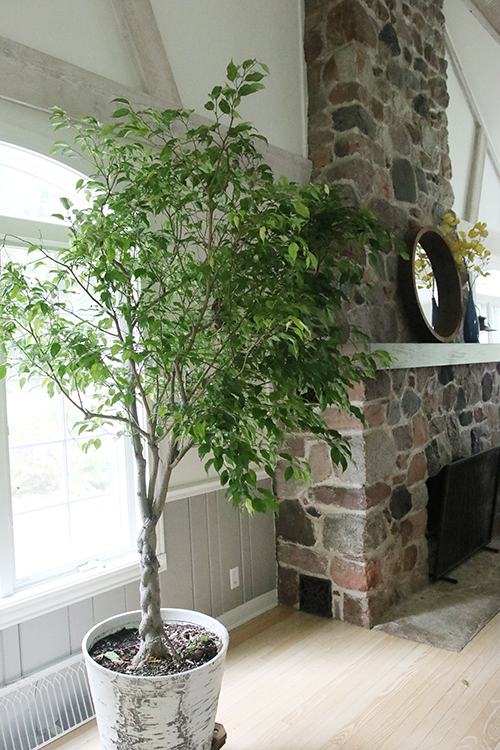 The ficus in its winter home in the living room, the only room with a high enough ceiling to accommodate it. The ficus has to live in the living room these days because its too tall for the room where the rest of the plants live. Getting it through doorways is a little bit like stuffing yourself into skinny jeans after a long winter, and I had to prune it even more than I planned to. But the ficus and all the rest of the plants have landed in their winter homes. And this year I promise to take better care of them. OK, I promise to try to take better care of them. 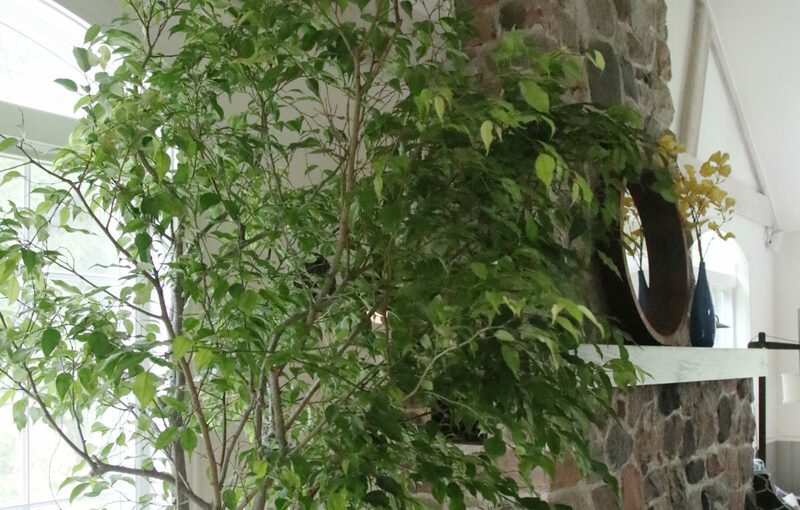 That ficus is gorgeous and I really like that birch-looking pot. And thanks for starting my morning off with a good laugh with that “skinny jeans” simile. I’m still laughing. Your ficus is beautiful and I’m certain your grandmother would approve! I haven’t ever seen one quite so lovely…the trunk especially. I don’t have any live houseplants, I have no good light honestly (only morning sun and late afternoon sun under a huge sycamore tree), and just end up killing them. My plants come from Hobby Lobby but this ficus may just give me the nudge I need to try again! I was just thinking the other day that it was about time to bring in the houseplants! I haven’t ever put my spider outside for the summer, maybe next year I’ll try it! My jade loves being outside in the summer and so does my mother of thousands which really flourished this summer. 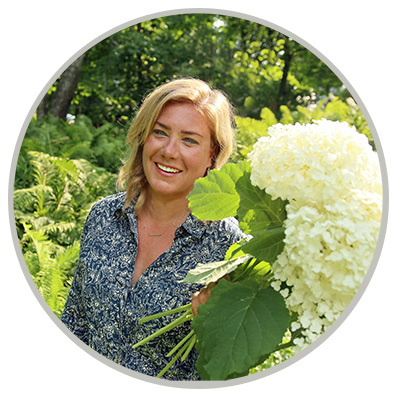 I am jus tike you – a successful outdoor gardner, but just don’t have the light or space for indoor plants in our small house. The only plant that I bring inside is an old purple oxalis (whose leaves close up every night, which fascinates me! ), however this year my teen son gave me a 3 foot tall hibiscus plant/tree for mothers day, so for sentimential reasons I will try to get through the winter in my home! I too struggle to keep my houseplants happy when they aren’t outside. Between the Banana, a Fig, an Orange tree, and a Bouganvilla- I’ve got my work cut out for myself this year. 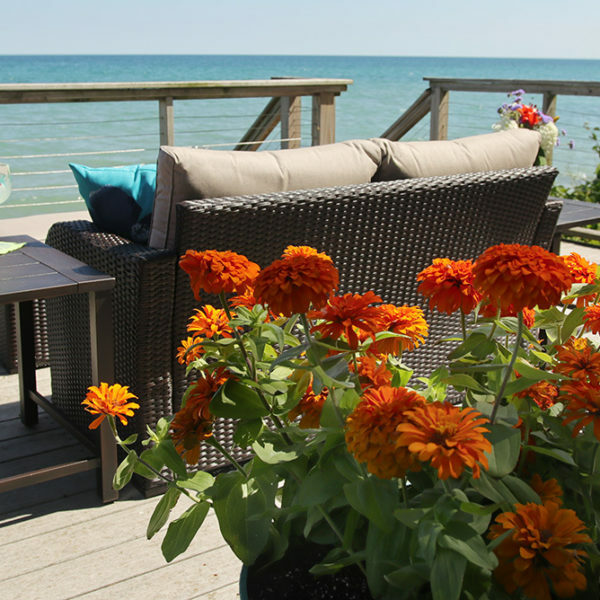 Do you ever have problems with Spider Mites with the plants being inside for so long? I usually wait to bring them in until the last possible moment, but some of them have already been inside for weeks with our awful fall weather. 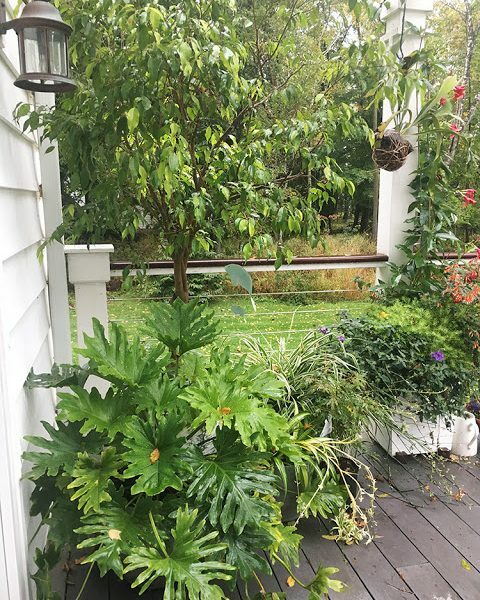 Finding a place for my houseplants can be a problem since they always grow quite a bit when outdoors and somehow my pumpkins and other fall decor have taken up their space! I did try to leave some empty pots to place them in when I bring them in and also will try to be selective with what comes back in. Must remember how much care they need if I want them to look good. I think I am lucky that there really isn’t room for houseplants at my place. I bought a Boston fern instead of a Poinsettia last year and just repotted it. I love the idea of plants with associations but don’t teally have any. It is that time of year. I am not bringing in many house plants this year. I have a 16 year old Staghorn fern that I have rehomed. I asked a Garden Club member here in town to put the word out it was up for adoption and luckily someone said they wanted it. I feel like I am rehoming a pet. I just couldn’t face bringing it into our small home again this year. I do have 3 other plants to bring inside. That is quite enough.